In just under 20 days time over 1,200 cities and towns across the world will be lighting up a monument in the twilight hours to mark the 10th annual Cities for Life Day. The movement was started by the World Coalition for Death Penalty as a form of protest appealing to nations of the world to repeal their policies on capital punishment. The day was chosen on account of the fact it marked the anniversary of the first time a state abolished the death penalty (Tuscany in 1786). You may have gleaned from the very fact I am composing this post, that I'm not a fan of the death penalty... and you'd be correct. I acknowledge there are no easy answers when it comes to how we deal with the worst offenders in society but I fundamentally believe that we must stand for values that fly in the face of barbarism when confronted by it; I also believe that if a person is a supporter of the death penalty, they can only do so in good conscience if they would personally be prepared to throw the executioners switch... anything less than this would be hypocritical. The idea of lighting a monument up in protest at the death penalty started with the Colosseum in Italy - a deliberate irony. The Colosseum played host to the death of countless individuals and innocents at the command of Emperors for the entertainment of the mob. I've had the privilege of standing inside it, without the knowledge of history you would scarcely be able to conceive that so much blood was spilled there. Nevertheless it was and so it is that every time a nation abandons capital punishment, or enforces a stay of execution... the once great theatre of death lights up to celebrate the preservation of life. The Colosseum: The first of many monuments to have lit up in protest at the death penalty. The thing about light is that when people see it in the distance it gives them hope, they see it as something desirable and it makes them think. So year by year this movement has grown and across the face of the entire planet, nations speak to nations by virtue of the light shining from monuments and buildings in support of life. 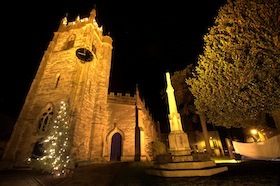 St. Nicholas Church, Alcester at night. The great thing about doing something like that is that anyone can get involved. Even if you don't have a monument in your own town or village that lights up at night, you can always pluck an image from the Internet that portrays a monument or building you find meaningful. Below my post is a video that illustrates the argument against the death penalty and why many groups and states have joined forces to get it universally ended. I hope you feel you feel this is a cause you can also support, joining me in this and adding an image to your own profile(s) as the day approaches. In your opinion, what can be done to administer effective/fair justice in society?